That's a clown game, bro. Yes, the header is correct. And no, I haven't sustained any (serious) brain damage. 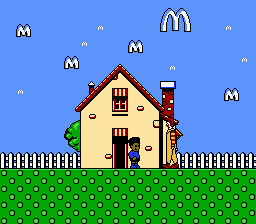 This entry into our 8-Bit Encyclopaedia intends to elucidate a NES game about McDonalds and their eponymous Clown Mascot. Developed by Virgin Interactive and released Stateside in February 1992, M.C. Kids (titled "McDonaldland" in Europe) follows two kids--Mick and Mack--as they try to retrieve Ronald McDonald's stolen magical bag. Seeing only screenshots like the one to the left, most dismissed the title as shill for hamburgers and french fries. Honestly, it's hard to fault this snap judgement; M.C. Kids, like so many product tie-in games (I'm looking at you Barbie and Muppets), looks cheap. The sprites, shown in the header above, are monochromatic and blocky compared to Mario and Luigi. And McDonald's golden arches are literally on every screen of the game. These first impressions are a shame, because M.C. Kids stands alongside Super Mario Bros. 3 as the pinnacle of platform gaming on the NES. 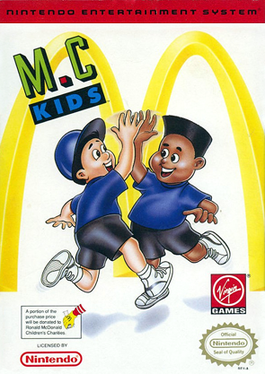 So I propose we re-brand the game and scrub away every last trace of McDonald's grease. Instead of M.C. Kids, let's call it Magic Kids. 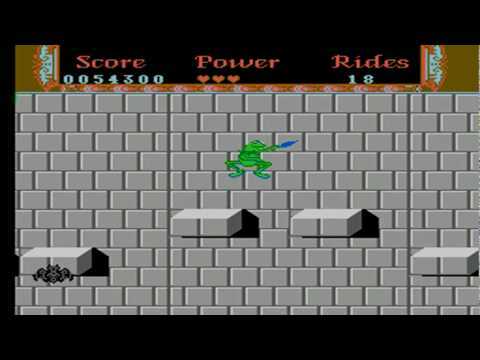 Instead of running through McDonaldland at the behest of Ronald McDonald, let's say Nick and Will are questing through Magic Land to help Walter Wizard regain his stolen Magic Bag from the sly Dragon. Much more palatable, no? Anachronistically re-branded, we'd find Magic Kids among the most hailed titles for the NES, described as a spiritual prequel to Super Mario World. 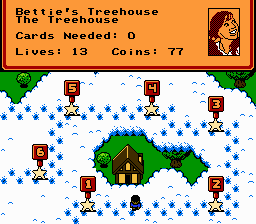 Where the goal of most platformers is to simply finish each level in order, in Magic Kids, our heroes must retrieve the Magic Cards scattered throughout the land in order to open the path to Walter's lost Magic Bag. Being objective-based rather than a simple left-to-right quest makes Magic Kids feel much more open than any other NES platformer. The quest to discover every hidden magic card also and adds replay value. Big surprise, we've got a cloud-themed level. The difficulty is ramped up via more advanced level design here. We've also got a few magic cards placed out of sight. 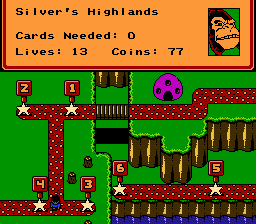 The Highlands of Silver the Gorilla is where the game gets interesting. The stage is divided into the highlands and the coast. Nick and Will must scour the first four stages to open the way from Bettie's Treehouse to the Coast. The level design gets more advanced, often requiring a player to double back or pay very close attention to the surrounding landscape. After clearing the highlands and beach, Nick and Will meet the Engineer. He's building a Rocket to the Moon, where the remainder of the Magic Cards are. Of course, to launch said rocket, what must be found? More magic cards. 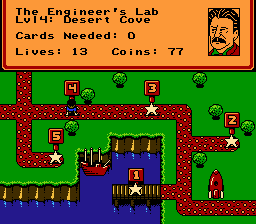 The Engineer's level includes the first set of levels which are legitimately hard. The Lab's stages are rife with falling stars and man-eating piranhas. Luckily, you'll have a few spare lives amassed by this point. After finding the Engineer's Magic Cards, Nick and Will rocket to the Moon and meet Cosmo the Astronaut. The remaining Cards are quite difficult to get, mostly owing to the almost non-existent gravity on the Moon stages and one-hit kill monsters which line the levels. 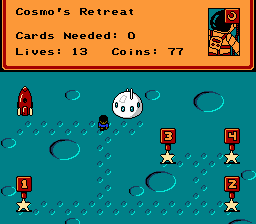 The final stage of Cosmo's Retreat is one long vertical jump from springboard to springboard. It's as fun as it is frustrating. 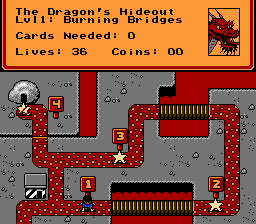 Magic Cards collected, Cosmo opens the path separating the Engineer's Lab and the Dragon's Hideout. Right off the bat, the Dragon begs for help. Apparently Walter's Magic Bag gained sentience and went berserker. This final stage includes only 3 levels. Compared to the low-gravity moon, the difficulty is not so great in the Dragon's Hideout. 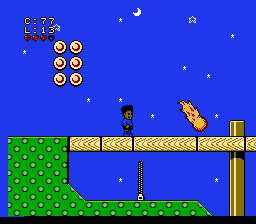 This final stage introduces a few new elements, such as lava and treadmill platforms, but it's a fairly easy path to the end. The final battle against Walter's Magic Bag will probably take a life or two to get the hang of. The Bag vomits a barrage of varying enemies: tapeworms, a magic wand and finally a Rabbit in a hat. Each enemy has a different attack pattern and the only available weapons are the finite pile of blocks to the left or dirt from the pile in the center of the room. The ending that follows is a bit whelming. Just a screen and a dialogue box. Overall, the game is surprisingly fun, much more enjoyable than its original corporate branding would predict. There's a nice variety in gameplay as Magic Kids progresses and the difficulty ramps up at a nice, steady pace. It's a pity McD's crapped all over this game; it's a real gem that's been largely overlooked due to its hamburger associations.